3259b-2, CENTER CAP USED, 98-01, FORD, EXPLORER, RANGER, SPARKLE SILVER, ENGRAVED FORD EMBLEM, 3 METAL LUG NUT CLIPS, 6-1/2" DIA. 3259e, CENTER CAP USED, 98-01, MERCURY, MOUNTAINEER, CHROME PLASTIC CAP, 15 FAKE ALLEN HEADS, RAISED MERCURY LOGO, 3 METAL CLIPS, 6-1/2" DIA. 3259e, CENTER CAP USED, 98-01, MERC, MOUNTAINEER, CHROME PLASTIC CAP, 15 FAKE ALLEN HEADS AROUND OUTER EDGE, RAISED MERCURY LOGO, 3 METAL CLIPS, 6-1/2 DIA. ALSO FITS 3261 RIM. 1007, CENTER CAP USED, 75, CHEVY, VEGA, CHROME METAL CAP, MACHINED CENTER, ETCHED BLACK BOWTIE, 6 METAL CLIPS, 2-1/2" DIA. 1007, CENTER CAP USED, 13", 75, CHEVY, VEGA, CHROME METAL CAP, MACHINED CENTER WITH ETCHED BLACK BOWTIE, 6 METAL CLIPS, 2-1/2" DIA. 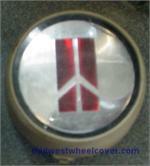 1057, HUBCAP USED, 15", 74-77, BUICK, CENTURY, LESABRE, ESTATE WAGON, POLISHED OUTER RING, 10 SLOTS, POLISHED BRUSHED FACE, BLACK BACKGROUND, TREE FLAG LOGO, RED, WHITE AND BLUE, METAL CLIPS. Price: ORDER UNDER 1111a HUBCAP CENTER. 1111b, HUBCAP CENTER USED, 87-88, BUICK, ELECTRA, LESABRE, PARK AVE, CHROME OUTER EDGE, BLACK CENTER WITH RED WHITE & BLUE FLAGS, HAS 3 NOTCH ON OUTER EDGE, 3 PLASTIC CLIPS, 3-1/4 DIA.,FOR A 14" HUBCAP, ORDER UNDER 1111a HUBCAP CENTER. 1117, CENTER CAP USED, 78-88, OLDS, CUTLASS, RWD, 5 LUG NUTCUT OUTS, 5 METAL CLIPS ON RING, BLACK BACKGROUND, 3-3/4" DIA. 1133, Hubcap CENTER USED, 91-92, BUICK, ROADMASTER, CHROME, BLACK BACKGROUND, CHROME CENTER RING, FULL COLOR LOGO. 4 PLASTIC CLIPS. 4-1/2" DIA. 1153c, Hubcap CENTER USED, 15", 04-05, BUICK, CENTURY, ALL CHROME PLASTIC CAP, RAISED LOGO, 5 PLASTIC CLIPS, WIRE RING, 7" DIA. 1182, CENTER CAP USED, 15", 80-83, CHRYSLER, CORDOBA, DIPLOMAT, DODGE, PASS, LEBARON, MIRADA, PLY PASS, CHROME, 5 LUG NUT HOLE, OPEN TOWER, 5 SCREW HOLES, FOR A ALUM, 10 SPOKE, AVAILABLE IN 6 COLORS, SCREW NOT INCLUDED. 6" DIA. 1190, CENTER CAP USED, 80-86, JEEP, CHROMED ALUM, ENGRAVED WORD JEEP, RIBBED, HELD ON BY 3 SCREWS, (NOT INCLUDED), 5" H X 5-1/2" DIA. 1195, Used Rims, 14X6, 5 LUG, 4-3/4", 78-87, BUICK, REGAL, CENTURY, 5 SPOKE, CHROME, STEEL. 1195, Used Rims, 14X6, 5 LUG, 4-3/4", 78-87, BUICK, REGAL, CENTURY, 5 SPOKE CHROME STEEL. 1228-F, CENTER CAP FRONT USED, 79-91, CHEVY, TR,4X4, GMC, TR, 4X4 CHROME, 6 LUG HOLES, 3 SCREWS, OPEN TYPE. 7" DIA. 1228-R, CENTER CAP REAR USED, 79-91, CHEVY, TR,4X4, GMC, TR, 4X4, CHROME, 6 LUG HOLES, 3 SCREWS, BLACK CENTER, 4X4 LOGO, 7" DIA. 1289, CENTER CAP USED, 82-84, FORD, BRONCO, TRUCK, CHROME, 5 CUT OUTS FOR LUG NUTS, BLACK TOP WITH CHROME RINGS & RED CENTER, SNAP ON TYPE, 5-1/8 X 3-1/8 CENTER, X 3-1/4" HIGH, FOR A 15", STYLED 5 SPOKE ALUMINUM RIM. 1295, Used Rims,15X6, 5 LUG, 4-1/2", 82-87, LINCOLN, CONTINENTAL,MARK SERIES, CHROME, STEEL. 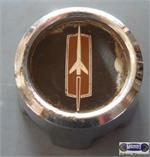 1295a, CENTER CAP USED, 82-92, LINCOLN, CONTINENTAL & MARK SERIES, CHROME, LARGE HEX NUT, GRAY BACKGROUND, GOLD LOGO. 6-1/2" DIA. 1295b, CENTER CAP USED, 82-92, LINCOLN, CONTINENTAL & MARK SERIES, CHROME, LARGE HEX NUT, RED MAROON BACKGROUND, CHROME LOGO, 6-1/2" DIA. 1295c, CENTER CAP USED, 82-92, LINCOLN, CONTINENTAL & MARK SERIES, CHROME, LARGE HEX NUT, WHITE BACKGROUND, GOLD LOGO. 6-1/2" DIA. 1326, USED RIM,15X7, 5 LUG, 4-3/4" 83-87, OLDS, CUTLASS, RWD, SUPER STOCK, GREY & CHROME 5 SPOKE, STEEL. Price: ORDER UNDER 1324 CENTER CAP. 1383/1324, CENTER CAP USED, 84-88, OLDS, CUTLASS, SUPER STOCK, CHROME WITH BLACK CENTER & CHROME LOGO IN CENTER. 3 METAL CLIPS PUSH ON. 2-3/4" DIA., FOR A 14", RIM, ORDER UNDER 1324 CENTER CAP. 1400b, CENTER CAP USED,14", 86-92, FORD, RANGER, AEROSTAR, CHROME WITH RED CENTER AND CHROME LOGO, PUSH ON 7-1/2" DIA".